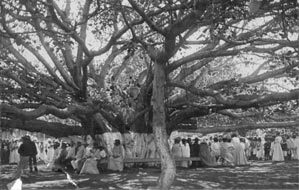 On April 24, 1873, to honor the 50th anniversary of the first Protestant mission in Lahaina, which was started at the request of Queen Keōpūolani, the sacred wife and widow of King Kamehameha the Great, Sheriff William Owen Smith planted the exotic Indian Banyan. At the time it was only eight feet tall. After settling in, the tree slowly sent branches outward from its trunk. From the branches, a series of aerial roots descended towards the earth. Some of them touched the ground and dug in, growing larger until eventually turning into trunks themselves. Over the years, Lahaina residents lovingly encouraged the symmetrical growth of the tree by hanging large glass jars filled with water on the aerial roots that they wanted to grow into a trunk. In time, what was once a small sapling matured into a monumental behemoth. It now stands over 60 feet high, has 46 major trunks in addition to the massive original and shades nearly two-thirds of an acre. 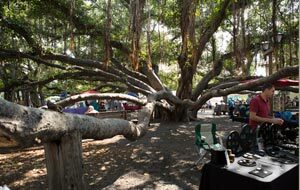 Maui County Arborist Committee carefully maintains the health and shape of this majestic tree. 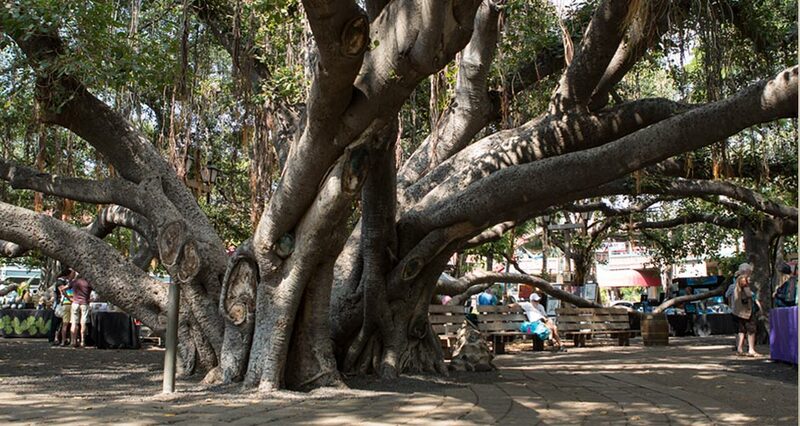 It is the largest banyan tree in the entire United States. 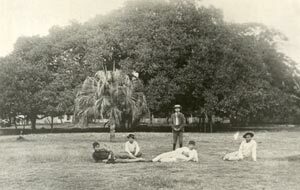 In recent times, the courthouse square was renamed “Banyan Tree Park” in its honor. Lahaina Restoration Foundation takes care of the park grounds. Over the years, the Lahaina Banyan Tree has come to serve many functions. First of all, it’s a great place to relax. Several benches are scattered under the large canopy to rest tired feet after a long day of sightseeing and shopping. It’s a favorite for taking photos. The long, undulating branches and stringy roots make for interesting backdrops. 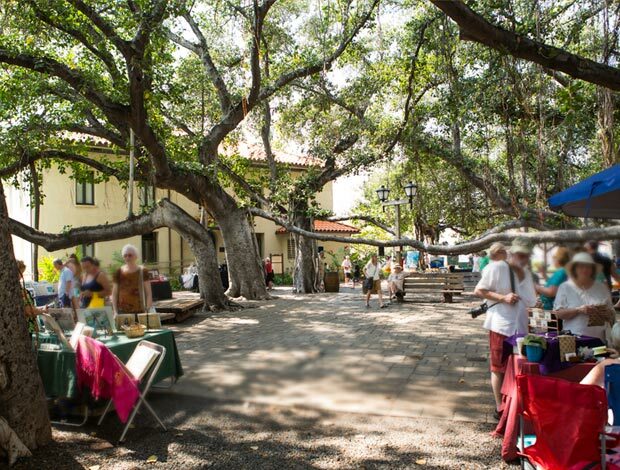 On the weekends, local artist and crafters set up tables and booths to display and sell their works from 9 a.m. to 5 p.m. Often, you can enjoy live music, hula and other cultural dances on stage in the park.